November favourites featuring Tangle Teezer, John Frieda, Oskia, Janina, Essie & more! The first product that I have used non-stop since I received it in late October is The Ultimate Finishing Hairbrush, which is a new release from Tangle Teezer. I've used The Original Tangle Teezer for years so when they got in touch to see if I would like to try one of their new brushes, I jumped at the chance. The original tangle teezer is the best way to gently, but effectively, de-tangle even the knottiest of hair and this new brush can be used both on wet and dry hair but it is also perfect for gently back combing and also to smooth the hair. The handle is genius - it's the one thing that I felt was missing from the original, especially for those of us with long hair. It comes in both black and shocking pink and is priced at £15. It's a brilliant new addition to the range and next on my 'to try' list is one of their blow-styling brushes! I've mentioned before that my hair lacks volume so I was delighted to be sent some John Frieda products from the Luxurious Volume range to try. I had used some mini samples of this range a few years ago but some new products have been added since then. The 7 day volume shampoo lathers well, smells fresh and doesn't leave my hair feeling at all stripped. Because I use hair masks regularly due to having damaged hair from a combination of hair dye/heated tools/ill health and lots of medication, I often find that regular conditioners are not moisturising enough for my hair, but that isn't the case with the 7 day volume conditioner. This conditioner provides ample moisture for my hairs needs and the combination of the two products really adds volume to my otherwise lifeless hair, but the piecé de résistance is the 7 day volume in-shower treatment. This is a semi-permanent rinse-off treatment, which is applied all over the hair after shampooing and conditioning the hair. It is then left on for 3-5 minutes, before rinsing and it is only to be done on every 3rd or 4th wash. The difference in volume is noticeable immediately and even more so after blow-drying. My husband even asked if I'd been to the salon when I first used this combination of products! Swishy, voluminous hair is mine with this trio! If you have fine or thin hair, I would highly recommend checking these products out. Now on to make-up! My most used eyeshadow palette this past month has been the Anastasia Beverly Hills Master Palette by Mario, which I reviewed here. I really hope that this dreamy palette is re-released because I know that so many of you want to get your hands on it. If you haven't read the post - the short version is that it is everything you could want in a palette & then some - pigmented, buttery soft texture, blends really easily and has excellent staying power! I have been really loving my Kat Von D Ink Liner this month. I bought both the Ink and Tattoo Liners but at the moment prefer using the Ink Liner because I find the felt tip applicator easier to work with (the Tattoo Liner has a brush applicator). This liner is very black and doesn't budge despite my watery eyes and oily eyelids (great combination!). The concealer that I have reached for most often this month is the bareMinerals bareSkin Complete Coverage Serum Concealer. I just love this concealer so much! It is perfect for both under the eyes and also on blemishes or areas of redness. It doesn't crease, is lightweight and really packs a punch in terms of coverage without being cakey. I bought it months ago and feel like I've just rediscovered it this month and it is perfect on no makeup days when I just want to cover up my dark circles without actually getting done up. The lip duo that I've loved over the past month has been Nars Audacious lipstick in the shade Fanny and MAC Pro Longwear Lip Pencil in the shade Rebellious. They are both pinky/purple/berry shades, perfect for this time of year. They are both quite creamy in texture but not too slippy and the liner is the longest wearing formula that I have tried. Nars Audacious lipsticks are intensely pigmented and so comfortable to wear - I really need to invest in some more! Any shade suggestions? 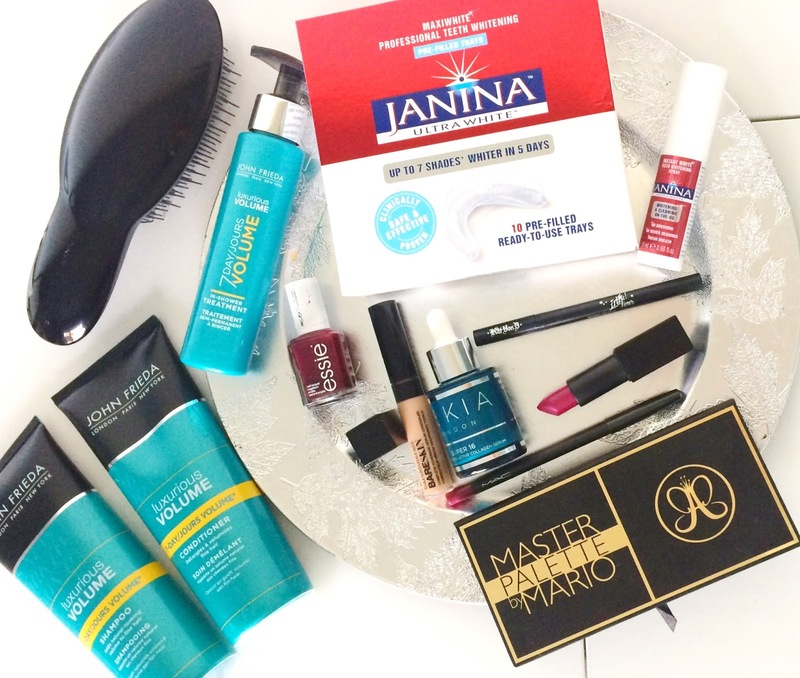 Around 18 months ago, I wrote a post on Janina Teeth Whitening products and to date, it is still one of my most read posts so I was delighted when they sent me some of their new releases to try. The products that made the biggest difference in terms on whitening my teeth last year were the MaxiWhite Whitening Strips, but the latest product in the range makes the teeth whitening process even easier and also faster. It is the MaxiWhite Professional Teeth Whitening Pre-Filled Trays, which whitens the teeth without the use of any harsh or abrasive chemicals - no stinging, sensitive teeth with this product! The pre-filled trays are individually wrapped and you place one of the top teeth and one on the bottom for 35 minutes (I did it at a time when I knew I wouldn't have to speak & caught up on youtube!) and then you discard the trays and rinse the mouth with water. I could see a difference after just one use but after using for 5 consecutive days, my teeth looked so much whiter and brighter and I have had lots of compliments on them! I highly recommend this product, especially for a special occasion or even better before the festive season starts because red lip products, can be unkind to teeth that aren't very white! To maintain the whiteness, I have been using Instant White Teeth Whitening Spray. I don't think that this could replace the whitening trays but for maintenance and on the go use, this is great. I just spray it on my teeth, swish it around for 1 minute and then spit it out. This has been keeping my teeth looking bright! I only recommend products that I really love so if you are looking for an effective but non-abrasive whitening product and only want to buy one product, I would opt for the trays as the spray is just an add-on to that. On my nails, I've been wearing Essie Sole Mate for the past few weeks. This deep plum nail polish looks so good at this time of year and I find that when I combine it with Essie Gel Couture Top Coat, the result is glossy nails that last around a week before chipping begins. Finally, the only skincare product that has jumped out at me this month is Oskia Super 16 serum, which I was very kindly sent in October. Regular readers will know that I am a huge fan of Oskia Renaissance Cleansing Gel and Mask, but I had never tried one of their serums before and was very excited to use this. The 16 in the name of the product relates to the combination of 16 super nutrients and bio-actives, contained in this product, one of which is Bakuchiol, which is natures alternative to retinol, which is a key anti-ageing ingredient. This milky serum leaves my skin feeling super hydrated, soft to touch, soothed and brighter. It has a pipette dispenser, which is perfect for controlling how much product I use and because I only need to use 2 drops per use, this 30ml bottle should last a long time. My skin has been loving this product and it has been my most consistently used serum in November. I would love to hear if you have used any of these products and what your thoughts on them are? Also, what have you been loving in November? Are you excited for December and all that it brings? Please tell me in the comments below!